Dogwoods and azaleas were blooming under a warm sun in South Georgia for the 5th annual Georgia Food Animal Conference March 29-31st. 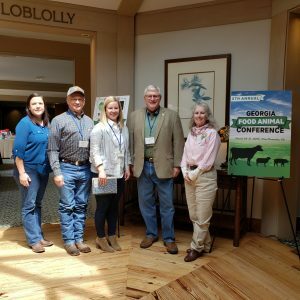 Bringing together producers, food animal veterinarians, veterinary and agriculture students, this annual event was better than ever. First started in 2014 by the Georgia Department of Agriculture (GDA), the event is now a collaborative effort organized with the Georgia Veterinary Medical Association (GVMA), the South Georgia Veterinary Medical Association (SGVMA), and the University of Georgia College of Veterinary Medicine. This year we had almost 90 registrants from 13 states. Industry has been a strong supporter of this meeting. This year we were sponsored by the Georgia Farm Bureau, Allflex, AgGeorgia Farm Credit, MultiMin90, Zoetis, Pneu-Dart, ADM, Bayer, Boehringer Ingelheim, Central Life Sciences, and ReproScan. Our common goal is to sustain all aspects of the cattle industry so we can prosper together. 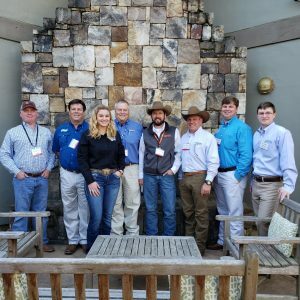 The state veterinarians from Georgia met with their counterparts in Alabama and Florida to discuss issues affecting the tri-state area. Left to right are: Dr. Misty Edmondson and Dr. Tony Frazier of Alabama, Dr. Janemarie Hennebelle and Dr. Robert Cobb of Georgia, and Dr. Diane Kitchen of Florida. Friday’s session, Farmers and Veterinarians: Partners in Stewardship, focused on common issues affecting producers and veterinarians alike, and promoted a sense of common purpose. Dr. Francis Fluharty, head of the Department of Animal and Dairy Science at UGA’s College of Agricultural and Environmental Sciences, covered opportunities to improve production efficiency in cow and calf operations. Dr. Gerald Stokka from North Dakota State University discussed a universal stewardship approach to cattle health including genetic selection, nutrition, environment, and biosecurity. Dr. Mark Hilton from Elanco Animal Health spoke on how producers can get the most value from a veterinarian’s visit with tips from helpful hay pads and vaccination protocols, to feed management and calving tips. Especially memorable from his talk are these two pearls of wisdom: “if your cow’s too fat, you’re wasting money but if your cow’s too thin, you’re wasting your investment”, and also “without records you will fail”. Dr. Brad Heins from UGA’s College of Veterinary Medicine covered the pros and cons of remote drug delivery. Dr. Kevan Lamm, a new assistant professor in the UGA Cooperative Extension, gave an inspirational seminar on finding your purpose to make positive changes that address world critical issues by focusing on your legacy. Morgan McArthur, a large animal veterinarian and Toastmasters world champion of public speaking, encouraged us to “choose challenge” to pursue growth and gain strength through our endeavors. Winners of our story-telling contest from left to right were Dr. Ava Talmage Dr. Lee Bruey, Dr. Stephen Deibler, Dr. Tony Frazier, and Dr. Robert Cobb. Friday afternoon wrapped up with a social hour “Tall Tails & other Fables and Foibles from the Field”. 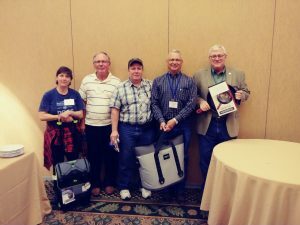 Sharing true stories of farm visits gone wrong and gone right, veterinarians, cattle producers, and industry representatives laughed over life experiences and competed to win a Yeti cooler and other prizes. Our grand prize winner, the state veterinarian of Alabama, Dr. Tony Frazier, told a very funny and embarrassing story that’s not fit to print but did involve the misreading of a lobby sign in a moment of urgency. If you ever have the pleasure of meeting Dr. Frazier, be sure to ask him to fill you in. Other winners included Dr. Ava Talmage of Amicalola Veterinary Services in Talking Rock, our own state veterinarian Dr. Robert Cobb, Dr. Stephen Deibler of A Mobile Vet in Dacula, and and Dr. Lee Bruey of Keystone Heights, Florida. Pneu-Dart demonstration on the lawns of Calloway Gardens. Saturday morning, an interactive story-telling session between veterinary students, recently graduated food animal veterinarians, and experienced veterinarians was moderated by Drs. Hilton and McArthur. Veterinary programs on Saturday included planning how to grow a veterinary practice, the challenges of screening for toxicology, toxic hazards in forages with UGA forage specialist Dr. Dennis Hancock, and remote delivery technology. The importance of forage sample analysis was a common theme stressed in several talks. Saturday afternoon wrapped up with a practice Pneu-Dart demonstration on the green lawn in the warm sunshine. Sunday’s topics included Bovine Viral Diarrhea (BVD) vaccination for protecting pregnancy by Dr. Paul Walz from Auburn University where the importance of using modified live vaccines was emphasized – “the best protection is when the best products are administered at the best time”. Our state veterinarian Dr. Robert Cobb spoke on Georgia regulatory issues especially cattle traceability, and we heard an update on the Veterinary Practice Act by Don Riddick. Sunday afternoon Dr. Ray Kaplan of UGA discussed the ongoing challenges and realities of parasite control in cattle. Thank you to all our sponsors from Georgia Farm Bureau, Allflex, AgGeorgia Farm Credit, MultiMin90, Zoetis, Pneu-Dart, ADM, Bayer, Boehringer Ingelheim, Central Life Sciences, and ReproScan! Products, technologies, issues and policies impacting cattle health and production are rapidly changing and producers, extension faculty and veterinarians alike need to stay current and find ways to work together to improve the lives of our livestock and farmers. Please join us and meet some great people who care about your cows as much as you. Save the Date! 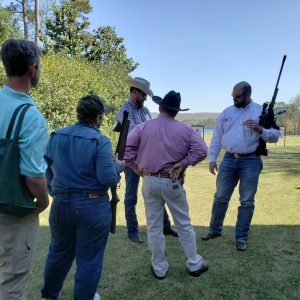 Join us next year, Friday April 24th, 2020, in Callaway Gardens at Pine Mountain, for a great opportunity to meet cattle industry leaders, food animal veterinarians, and other producers surrounded by all the glorious beauty of springtime in Georgia.